Did [Go, Baby, Go] make a difference in handle or attendance? “Good timing” is an understatement: 1998-2004 was the rise of the Internet as we now know it. The industry’s various factions simultaneously managed to catch the moment, via ADWs, and squander it. … there also remains the undeniable fact that claiming races, by their very nature, serve to weaken the inherent responsibilities of both ownership and animal husbandry. The demands of constant turnaround require short-term solutions in veterinary care. The claiming game also nurtures the ability to suppress any real emotional attachments to the horses involved. They are, after all, merely transients — poker chips, as one famous claiming owner called them — no more or less than means to an end. What’s the future for claiming races? That’s one of the questions I took away from reading the New York Task Force report, which determined that sharply increased purses “commoditized” lower level claiming horses earlier this year, and suggested reforming claiming rules so that claims may be voided if a horse is vanned off. “The voiding of a claim should not require the death of the horse,” the report’s authors write on page 60. Practical, humane — exactly the sort of rule change that’s necessary if claiming races are going to continue to be a significant part of the game. But while the imbalance in purses and claiming prices at Aqueduct may have led to the resulting claiming frenzy last winter, it didn’t actually commodify the horses, because they were already commodities. Most in racing don’t question the system — the claiming game has been a pretty elegant solution to keeping races competitive over the years — but it’s becoming harder to defend. … for the Racing Post website. This morning, on noticing that Man of God, eighth to stablemate Frankel in his winning August 13 debut at Newmarket, had won at Yarmouth yesterday, I clicked over to that one’s Racing Post profile, with one question: Had any other horse in that race come back to win? There, I clicked on the race date, then on each finisher’s name, getting a pop-up window with each of their complete career records, and in five minutes — without logging in, entering credit card information, or downloading any PDFs — I had the answer. It was a breeze, as it is every time I visit. The site is data-rich and user-friendly. More advanced features require registration and/or payment, but elementary research can be accomplished with ease. “We’ve embraced the internet as openly as any sport that I’m aware of,” said NTRA president Alex Waldop in a recent TDN interview. “When it comes to the horse stuff, I think we’ve done a good job,” Equibase president Hank Zeitlin told the Paulick Report. Never mind the DRF, which has invested considerable resources in developing Formulator, a powerful handicapping tool hobbled by an outmoded card-based navigation and subscription model, while letting products such as Simulcast Daily stagnate. All it takes is a few minutes with the Racing Post to realize how far the American racing industry has to go to bring American racing fans an online tool as simple and useful. To Ramon Dominguez: The rider reached a milestone on Friday, earning win #4000 aboard Fortyninegeorgest in the second race at Aqueduct. Dominguez, who began riding in 1996, spent his first full season at Saratoga in 2007, and moved his tack full-time to New York in 2009, won an astounding 376 races on the circuit last year, sweeping every riding title. Should he keep up that torrid pace, Dominguez can look forward to hitting win #5000 by 2013. To Rosie Napravnik: The 21-year-old jockey scored her first graded stakes win in the Cicada Stakes on Liam’s Dream at Aqueduct on Saturday. 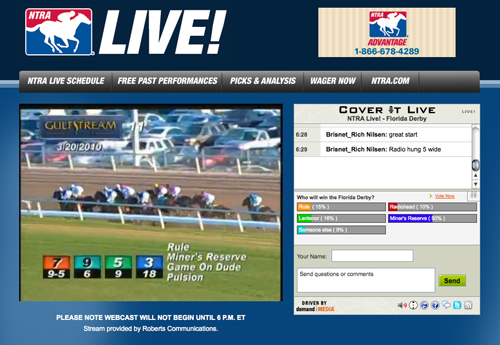 To the NTRA: After the embarrassing fizzle that was the March 13 launch of NTRA Live!, the organization rebounded on Saturday with a near-flawless webcast of the Florida Derby, which was displayed on a clutter-free page with clear, helpful links above and a live chat running alongside. NTRA vice president Keith Chamblin told the Thoroughbred Times that the NTRA “added some servers” and did additional site testing in advance of yesterday’s show. The NTRA also apparently removed the requirement to register or login before viewing (perhaps they took Superfecta’s advice? ), as it was possible to pull up the page without being prompted to do either. Although demand was probably lower for the Florida Derby webcast than it was for Rachel Alexandra and Zenyatta, the steps the NTRA took to bolster their capacity to host viewers surely helped make Saturday’s live video a success. Well done!